On Sunday (August 23), Dundas, ON's upcoming Greenbelt Harvest Picnic posted a statement saying that, "due to a scheduling conflict," Iron & Wine had been taken off the bill and replaced by the Rural Alberta Advantage. Now, Iron & Wine has responded with a statement, offering a very different reason behind the lineup change. In a letter posted on Facebook, Iron & Wine explained that the festival required its performers not to perform within 100 kilometres of Hamilton this summer. Iron & Wine stated that the act kept up its end of the bargain, but the festival apparently took issue with project head Sam Beam recently performing in Buffalo as part of his duo with Ben Bridwell of Band of Horses. The letter points out that, not only is Buffalo 120 kilometres from Dundas, but this was "a different project with a different band with different songs." The band attempted to reach a resolution with Greenbelt, but ultimately the festival cancelled the appearance, according to Iron & Wine's message. Iron & Wine clearly isn't happy about the situation, but wished attendees of the festival well and said that Beam and co. are planning to book a show in the area soon. Read the full letter below. Greenbelt Harvest Picnic takes place on August 29. Performers include Gordon Lightfoot, Bahamas, Basia Bulat, Kathleen Edwards, Martha Wainwright and more. We regret to inform you the festival has chosen to remove Iron & Wine from the lineup. Their statement that there was a scheduling conflict is inaccurate. 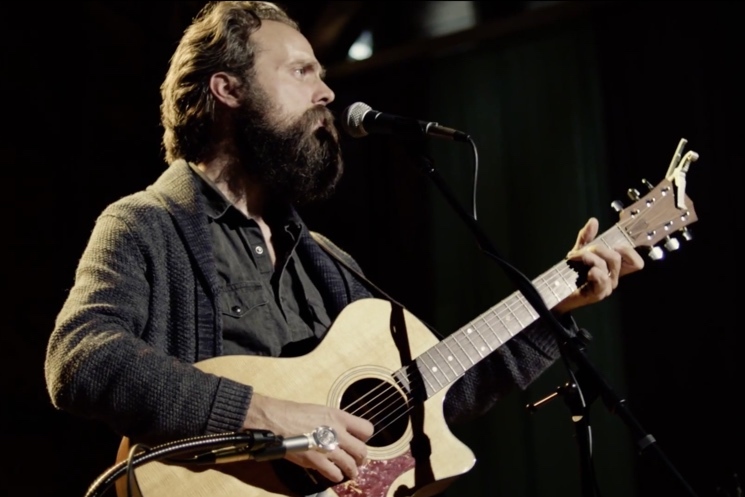 A few weeks ago, Sam Beam of Iron & Wine and Ben Bridwell of Band of Horses, were able to do a short tour supporting their album "Sing Into by Mouth." This tour made a Thursday night stop in Buffalo, NY, about 120 kilometers from Dundas. The organizers of the Greenbelt Harvest Picnic felt this show violated their request that Iron & Wine not perform within 100 kilometers of Hamilton. We didn't see Buffalo as a conflict when we booked the tour for Iron & Wine with Ben. It was a different project with a different band with different songs and, we thought, far enough away from the festival. And though we disagree that we were technically in the wrong, Iron & Wine made multiple attempts to reach a solution to make good on what the Festival saw as a problem. They saw it as a significant enough problem to tell us not to come at all. "Due to a scheduling conflict..." can sound like a polite way of saying that something more important came along. It's important to us that you knew that wasn't the case and we're sorry we won't be able to be with you this weekend. We are working to reschedule an event in the area sometime very soon. Our hope is it will in some small way make it up to our fans - whom are our #1 priority - for the disappointment the festival has caused all of us. If you are planning to attend we hope you enjoy a great day of music and weather!